Winter is a beautiful time of the year, especially when a fresh layer of new snow covers everything. Winter can also be a very dangerous time of the year. If you plan on traveling during the winter, it pays to be prepared for the unexpected. 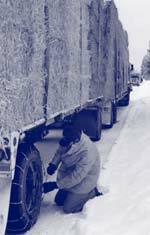 Getting stranded during a winter storm can be a very dangerous situation. Your friends at AlfredNY.Biz want you to enjoy the beautiful season of winter. With that in mind, we have developed this information to provide some basic safety tips when traveling on roads and highways this season. Following a few simple driving habits like planning ahead, driving at a safe and legal speed, driving alert and sober and buckling up should ensure that you arrive at your destination safely. Clear snow and ice from all windows and lights – even the hood and roof – before driving. It's the law. Know the current road conditions. You can click into our weather page and type the zip code of your departing location and your destination location to check for weather conditions. Use brakes carefully. Brake early. Don’t stomp on the brakes apply them gently and slowly for vehicles equipped with antilock brakes or pump them gently in vehicles with no antilock brakes. Remember, it takes more time to stop in adverse conditions. Again, Don’t Pump Antilock Brakes. If your car is equipped with anti-lock brakes, do not pump brakes while attempting to stop. The right way is to “step gently and steer". Don't over steer! If you should start to slide - steer gently in the direction you wish the car to go. Don't jerk the wheel - just steer it smoothly. Over steering or jerking the wheel can make the car even more unstable like increasing arcs of a swinging pendulum. If the car starts to slide - remain calm, take your foot off the accelerator, steer into the skid and if necessary apply the brakes accordingly. Don’t use your cruise control in wintry conditions. Even roads that appear clear can have sudden slippery spots and the short touch of your brakes to deactivate the cruise control feature can cause you to lose control of your vehicle. Don’t get overconfident in your 4x4 vehicle. Remember that your four-wheel drive vehicle may help you get going quicker than other vehicles but it won’t help you stop any faster. Many 4x4 vehicles are heavier than passenger vehicles and actually may take longer to stop. Don’t get overconfident with your 4x4 vehicle’s traction. Your 4x4 can lose traction as quickly as a two-wheel drive vehicle. Look farther ahead in traffic than you normally do. Actions by cars and trucks will alert you quicker to problems and gives you that split-second extra time to safely react. Go slow! Drive according to conditions. Reliable transportation is especially important in the winter. Not only should you keep your vehicle in top operating condition all year round - for safety and fuel economy - it is especially important to get it winterized to avoid any unpleasant or dangerous situations while traveling in frigid weather. Always fill the gasoline tank before entering open country, even for a short distance, and stop to fill up long before the tank begins to run low. Keeping your tank as full as possible will minimize condensation thus reducing the risk of gas line freezing and providing the maximum advantage in case of trouble. Include road flares, a blanket, heavy boots, warm clothing, and flashlight with batteries. Check out road and travel conditions at our weather page for real-time weather conditions and forecasts. Just type in your zip code or the zip code of your destination and pertinent stops along the route. Local radio stations provide motorists with specific road conditions. Give yourself some extra time to reach your destination. Roadways get slick when freezing air circulates above it. Remember bridges and overpasses typically freeze before other road surfaces so you don’t want to do any hard braking or quick accelerations. When snow falls statewide, time and resources are focused on the most heavily traveled state routes and interstates first, so motorists in rural areas may not see a snowplow right away. Lake effect storms can produce lines or belts of squalls that can severely impact driving conditions in areas otherwise thought to be safe for driving. You could drive a short distance and in our area of Western New York and go from clean roads with good visibility to heavy squalls, snow covered roads and blowing and drifting snows limiting visibility. Check for advisories in areas known to be traditional "snow belt" areas. In New York State the bare minimum for legal tread depth is 1/8" (2/32) of tread. We advise that you don't let the tread on your tires dip below 5 or 6/32 of tread for driving on snow covered roads. A new tire will have between 10/32 and 12/32 of tread when it is installed - big difference in saftey. Approved traction tires are labeled “Mud and Snow,” “M+S,” “MS,” or “All Season.” These tires can be used year-round. Studded tires are an option but are only legal between November 15 and March 15 (check state laws to be certain). Caution should be used if you own a front wheel drive vehicle and are considering installing studded winter tires. While increasing traction to the drive wheels installing studded tires on the front of the vehicle can actually reduce the vehicle's handling drastically. The front tire grip so much quicker than the rear tires that the vehicle may behave poorly and fishtail (become "rear ended") when cornering. Tire chains are also an option and come in many varieties such as “cross link,” and/or “cable chains,” and plastic or nylon chains. Most are legal for passenger vehicles when used properly. Again, caution should be used when installing these types of traction enhancers as well as driving on them. Be sure to follow manufacturer's instructions and use good judgment as to a safe place to be parked when applying them. Parking areas are much more advisable than roadsides when installing tire chains. With the winter months and colder temperatures come the potential for icy build ups on windshields and lights. Anti-Icing windshield additives and spray deicer are good to have on hand for these types of icing. These chemicals lower the freezing point of water, which in turn, lowers the temperature at which ice will form in lines and on surfaces. Keeping your vehicle clean during the winter keeps snow, rock salt and road grime from caking on your head and taillights, which makes it easier for you to see and be seen. Anti-icing chemicals can cause corrosion so you want to wash them from your vehicle. All the chemicals are water-soluble so rinse your vehicle thoroughly before applying soap. If towing aluminum boats or trailers, be sure to wash them, too. Keep your windows clean as well both inside and out for maximum visibility. We even carry a small bottle of window cleaner to clean headlights, taillights and side windows periodically to remove road spray and road grime and increase lighting and visibility. Don't travel in adverse conditions unless it is absolutely necessary. A little common sense and some good judgment go a long way toward keeping you and your loved ones safe. Drive carefully and arrive safely!